Crow’s feet are the wrinkles that develop around the eyes when someone is smiling or laughing. Typically, crow’s feet are composed of both dynamic lines and static lines. Dynamic lines are the lines that are produced by your underlying muscles, which you can visibly see when your face is particularly animated, i.e. when you’re squinting or smiling. Crow’s feet, however, also consist of static lines: lines that are there even when your face is at rest. Static lines are due to a long history of squinting, frowning, and sun damage. Here is a look at what causes crow’s feet and the treatment options that are available. Repeated squinting and smiling is a common cause of crow’s feet. As we age, our skin becomes thinner as the natural rejuvenation process slows down. Therefore, crow’s feet become more prominent. This is especially true of the eye area where skin is already very thin and lacks fatty, thick tissue, which keeps skin firm and tight. Sunlight damages the skin and causes aging to take place much more rapidly. This is true for any aging of the face and body, crow’s feet included. That’s why it is imperative that you protect your skin with sunscreen any time you are going out in the sun. Free radicals are another cause of crow’s feet. Free radicals damage cellular DNA and lead to aging. There are many different causes of free radicals, including smoking and sunlight exposure. If you spend a lot of time sleeping on your side, this can actually cause crow’s feet to develop. This is why some patients sleep on their back. While it may take time to train yourself to do this, it can certainly be done with a little work. 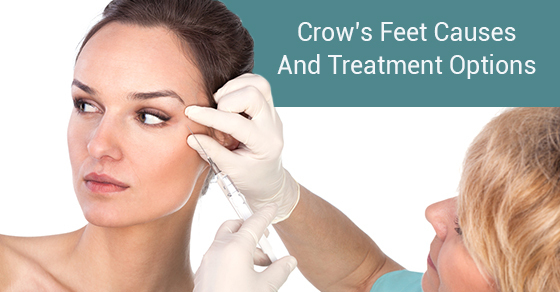 Botox is typically the first line of treatment when it comes to crow’s feet. It is particularly effective against dynamic lines. Botox works by effectively relaxing the muscles underneath the lines. Over time, Botox eye injections not only reduce the appearance of those dynamic lines but also works as a preventative measure against future aging by effectively weakening the muscles over time. If you are interested in Botox, consider Skouras Eye and Cosmetic Centre. We are a leading cosmetic surgery centre in Toronto. To schedule an appointment or for more information, contact us here.